When Labour lost the last general election, home educating [HE] families in England knew this would not signal the end of the pressure for change in HE legislation. We hoped though that there would be a considerable lull, not only whilst the coalition government settled in together and worked out their priorities, but we were also aware that funding for any potential changes could be delayed due to limited cash-flow. We did expect some ‘bother’ when the Khyra Ishaq Serious Case Review was published in July 2010. That event came and went with relative calm on the HE horizon, largely because its criticisms were focussed on the failure of various sections of Birmingham City Council’s social care department. It was always clear though that the prevailing calm was only superficial. Beneath the surface many educational and social care ‘professionals’, we suspected, were lobbying hard to bring about change along the lines of Graham Badman’s very bad review. 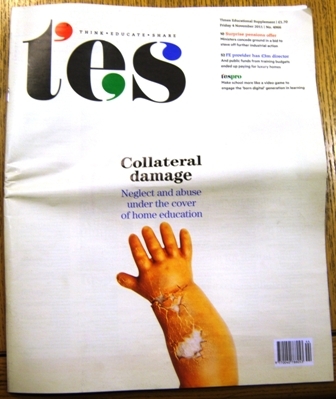 It was however quite a shock when this uncertain calm was shattered early in November 2011 by the front cover of the TES Magazine, which read “Collateral damage – Neglect and abuse under the cover of home education”. “hundreds are at risk of abuse and neglect”. When I read this, I had to ask whether he had actually read the Serious Case Review [SCR] and/or the judgement of High Court Judge in the 2009 care hearing concerning Khyra’s siblings? (My reflections on both are here and here respectively.) No one carefully reading either of these documents can come away from them describing the Ishaq household as an “apparently loving family”. The six children’s natural father Ishaq Abuzaire had drifted away from his wife, Angela Gordon, over a period of months or perhaps years – no one is certain when he finally left her with six children all under ten. Before Khyra’s death in mid May 2008, the police had been involved with the family on several occasions, including claims of violence towards the mother and some of the children. As far back as March 2006, the mother went to the GP with one of her children, whom she claimed had been hurt when the father pulled them out of a chair. The GP advised her to contact the police, but failed to report the matter themselves. One week later a Health Visitor who attended the home after a call to Children’s Social Care [CSC] from a concerned anonymous caller. In February 2007, the mother made further allegations of physical and emotional abuse by the father, and a Health Visitor referred the family to CSC as she was required to do. The SCR does not give any indication that this referral was acted upon. If it was not followed through then it set a very sad precedent for the months which led up to Khyra’s death. Fact: Two independent witnesses agree that what could have prevented the death of one child and the malnutrition of five others was better assessments and adherence to procedures by a number of social services departments. Fiction: That flaws in HE legislation contributed to Khyra’s death. Before the days of the professional foul, footballers often gave the impression that they played by the adage that if all failed, they should play the man not the ball. In debating circles this is described as an ad hominem attack, and is a tool employed by those whose arguments are weak. Can HE parents take encouragement from the fact that those who seek to control other people’s families are so short on sound reasons that they have to resort to personal attacks upon us rather than reasoning their case. However, articles like these are not really aimed at HE parents, but rather at teachers and others who are so institutionalised that they find it hard to see beyond the school fence. As Kelly recognised in his piece, it is they who are most threatened by HE, assuming that when parents choose that option, it is effectively a slap in the face for the teaching profession. It is now over three months since the TES published this article, so I am not writing now for those who were inflamed when they first read these comments. As I made clear above, the pressure for regulating HE has been relieved only temporarily by the change of government, not dispersed completely. I fully expect that when the political opportunity opens up again, those in favour of the supremacy of the State in education will once again press hard for change. When that time comes, it will be important that there are reasoned responses to sensational claims like Allen’s available to those who know little or nothing about the facts of this argument. and that describes exactly what we once were and would be very pleased to return to, provided it is safe to do so. For now though, articles like those in the TES only serve to remind parents who are seeking the best for their children that those who think that we cannot be trusted to deliver are still lobbying for change. There are important issues raised by this argument and it is very telling that those who want to make the State all-powerful in the training of children do not address that issue directly, but repeatedly seek to play the safeguarding card. Read both these TES articles carefully and you will see that neither has any evidence of abuse, just innuendo and hearsay. Let me repeat, the death of Khyra Ishaq was caused by failures amongst Birmingham City Council staff and departments, not by HE legislation which is not fit for purpose! JEREMY VINE: OK. Hold it there, let’s go back to Vijay for a second. She’s making a fair point, Vijay, if you can’t back up anything you’re saying with figures. VIJAY PATEL: Well, they’re hard to come by and I can’t talk about the London Safeguarding Board, but I will say there’s a.. there is one case which was in the media two years ago: the case of Eunice Spry, but more important..
JEREMY VINE: Well, one case is… I’m sorry, if I..
ANNETTE TABERNER: I’m happy to talk about Eunice Spry actually, because Eunice Spry did cooperate with her local authority..
JEREMY VINE: Can I.. sorry.. Annette, I just don’t want to go into an individual case, if that’s OK.
JEREMY VINE: Vijay, have you got any statistical base at all? VIJAY PATEL: We.. the inf.. We don’t have the evidence there statistically, no. JEREMY VINE: So why are you, why is anyone else worried about child abuse in homes where children are home educated? VIJAY PATEL: We are not against home education. Now we need to be clear about that. We have.. it’s really that… Parents should decide what’s in the interests of children. What we do want is that… It’s important children are safe. And we know in some cases, some people are very skilled at hiding behind law and guidance and saying: I shall just keep my children at home so nobody knows what is happening. I can only ask if it is just, that with a complete lack of evidence as admitted by Patel, that he and others including the TES should headline fantastical claims like “Collateral damage – Neglect and abuse under the cover of home education” and “Parental rights, and the wrongs of the wicked few”? Is it honest journalism to put a damaged doll’s arm on the front of the magazine when there is no evidence of a single bruise resulting from a parent beating their child and hiding their abuse specifically behind the camouflage of home education? I am confident that if the opponents of HE had any real evidence, they would not have to resort to false claims that some children were abused because they were home educated and out of sight. The debate brings back my thoughts as children’s secretary when I first heard the facts about Khyra’s short life and terrible death from starvation. It was always clear that many factors must have contributed to Khyra’s death, and the serious case review confirms that poor communication and a failure among some professionals to follow procedures were among them. Above all, though, the adults closest to Khyra bear responsibility for what happened and they have rightly been held to account for it in the courts. When considering all of the information presented within this report and specifically, that contained within Section 11 Missed Opportunities, it can only be concluded that the death of the child was preventable. This finding concurs with judgements made within the care proceedings that, the death of the child is the responsibility of the mother and the adult male, but can only conclude that had there been better assessments and effective interagency communication over a period of time it could have been prevented. The death of a child is always a difficult and poignant experience, but when that child has sustained extended punitive brutality and starvation by adults who should have been there to care and protect them, failing in their duty even in the latter stages to seek medical intervention, it is almost beyond our comprehension. It is the duty of us all to ensure we understand why these tragic events occurred and do everything in our power to prevent such a tragedy from ever occurring again. Of course Mr Balls believes that the State is good and that people who disagree with him are bad. I suspect that it was as important to him that in Khyra’s case he distract attention away from the failures of the State as it was to turn the heat onto non-conformist HE parents. Could his real problem be that HE children probably stand more chance of growing up as free-thinkers, than the children schooled in the ideologies he so vehemently espouses? I have not heard him in conversation with Jamie Oliver, but I suspect that he would willingly support Oliver’s campaigns for sustainable pig and chicken farms and quickly decry battery farming (after all, these days such things are vote winners). What we do know is that Balls and his socialist friends are against free-range children – compare the opposition of the powerful to the education of the masses when Sunday Schools were first started to teach children to read. Under Blair & Brown’s Labour, school education was focused more and more upon training children to give the required answers and not to think for themselves. In theory, social services can take up where the school left off when a child is de-registered. But they can never match the daily contact teachers have with children, making it harder for signs of mistreatment to be spotted. And legally, though the law is often misunderstood, whether a child is safe and whether a child is receiving a suitable education are separate issues. Information from a sibling’s class teacher for medical due 7th May 2008 that child was described as thin, weak, tired easily, felt the cold easily, skin was a little better at present. 7th May 2008 – the mother did not attend for a sibling’s medical appointment, when seen, the child weight was described as down slightly, height was recorded as static, and a further review is planned for September 2008. Given the concerns raised by the school staff and the fact that the child’s weight was down it is surprising that a review was set for September some four months hence. Additionally, no plans were made to undertake follow-up home visits by the school nurse or to inform other agencies. The theory Mr Allen espouses sounds good, but the tragic case of this unhappy family tells us that it can be nothing more than a theory, as care staff are only human themselves. I would have thought that if there were to be any occasion when the ‘daily contact teachers have’ should have rung alarm bells, it would have been M’s medical. But just as the requests from the staff at Khyra’s school were ignored, so too the data from M’s medical fell on deaf ears. M was not safeguarded by being in school, Khyra was not at more risk because her mother had appealed to HE law to withdraw her from school. It was at the point she was withdrawn from school that her teachers cried out to CSC for help, and it was that department which turned its back on them, on Khyra and on her five brothers and sisters. Oddly, the numerous cases of pupil catastrophe that punctuate the regular system are never used to trash the concept of “school”. Perhaps the HE lobby is not so nasty after all and we don’t punch below the belt, as our opponents are all too ready to do. Mrs Price says she knows of several examples where schools have encouraged the parents of pupils whose performance and attendance is poor to consider home education instead. The arrangement protects the school’s statistics and saves an exclusion being recorded against the child’s name in case they want to return to mainstream education later. He follows this by quoting an unnamed senior education welfare manager who confirmed the practice was widespread. The vast majority of HE parents have not taken on the responsibility of HE without careful thought. It is costly on many fronts. Time, money (usually one parent has to stay at home), emotions, energy are all consumed in large amounts by those who seek to give their children a family-based education. (This is one reason why we would like to crawl back into the pre-Balls and Badman world we used to enjoy.) The blood, sweat and tears alone are enough to provoke us to warn any prospective HE parents not to rush in where others fear to tread. These difficulties do temper all the good things we and our children share as we learn together, but we value the benefits sufficiently that we can work with the hardships. However, I can think of nothing more dreadful than parents who are already struggling to bring up difficult children being told by school teachers or educational welfare services that they are about to be prosecuted, but they could avoid it by de-registering the child. Hear-say evidence of the kind offered by Jenny Price abounds, but the very nature of it means that no school is ever going to record that such advice was given. Now if there is any case for change in HE legislation, then this is where it lies. Unprepared and ill-informed families are probably also unmotivated with regard to the effort required for successful HE. If a parent is struggling to get a child to school, they will almost certainly struggle to motivate them to learn at home, unless they are a genuine school dissenter – often labelled as phobic by the educational system – one who really does want to learn, but not in a class of thirty. Whilst schools need to realise that school is not always the best place for children to learn, there should be a law preventing them from ‘leaning on’ parents to de-register children in order to protect a school’s league table position or reputation. If the TES wanted to change the law in that respect, I would join them in the lobbies. Let me therefore end on a positive note. It could be argued that HE in the UK got off to a bad start. In the 60s and 70s many who favoured it came from the anti-establishment hippy/traveller sector of society. This did not go down well with many local authorities, which were on the whole staffed by people who were very committed to the system. Such polarisation made any building-up of trust impossible, as did officials’ readiness to resort to legal action, and so a gulf was created between the two parties. However, because most local authorities were too busy running schools, they did not have the time or energy to root out HE families. That was certainly our experience in the 80s when we lived in Manchester, which had not thought through its policy on HE. Whilst there have always been cases where the two sides clashed, for many years most HE parents just got on with the task they had chosen not to delegate to a well-meaning State. That status quo was shattered in 2009 when, driven by his Socialist ideals, and aided by the United Nations and European Convention on Human Rights, Balls decided that it was time to push the door ajar as a first step to bringing HE under State regulation. In time his plans could have very easily enable Big Brother to insist that a National Curriculum, etc. must be followed. What he and Graham Badman had failed to take into account was that the increasing numbers of HE families in Britain had changed the demographic of the HE constituency. It was no longer populated by fading hippies who found it hard to organise themselves. Almost overnight Balls and Badman mobilised an army of articulate, confident and determined people. A lobby with both bark and bite came together from nowhere and took Westminster by storm. I suspect if local authorities could de-institutionalise their staff so that they could recognise that there is now throughout the country a very big self-help group with years of experience at its finger-tips, then there may be a way the two could work together. If teachers could set aside their professional pride – they need not worry because most HE parents have no desire to teach in schools – and accept that mums and dads can teach their own kids quite well, then partnership may be a way forward for all. Few if any HE families wish to come under the State’s control, but many would be more than willing to advise and support families who were considering HE. Some, I am sure, would be willing to help any family who were struggling with a child who hated school, but still wanted to learn. Could a more helpful way forward be appreciation of our sincere efforts rather than demonising us in the pattern of Balls, Badman and now the TES? I wish I was confident that the rhetoric will soon stop, but I am far from certain it will. This entry was posted on 15/02/2012 at 4:26 pm and is filed under Home Education UK, State Safeguarding UK. You can subscribe via RSS 2.0 feed to this post's comments. Responses are currently closed, but you can comment below, or link to this permanent URL from your own site.